Digital Guardian extends the built-in Microsoft security with the enterprise DLP features, analytics and reporting corporations need to secure sensitive data in Office 365, SharePoint Online and OneDrive. Organizations that are implementing Office 365 need to make sure that it’s secure. Office 365 has many built-in security features, including some DLP. But for organizations accustomed to integrated enterprise DLP features, advanced dashboards, advanced reporting and more, Microsoft’s built-in DLP is likely to fall short. Digital Guardian picks up where Microsoft leaves off for the security, analytics, and enterprise-wide visibility your organization requires. Where the controls for Office 365, SharePoint and OneDrive focus solely on the cloud, Digital Guardian extends them to include coverage for your on premise data, and can prevent sensitive data from getting to the cloud in the first place. 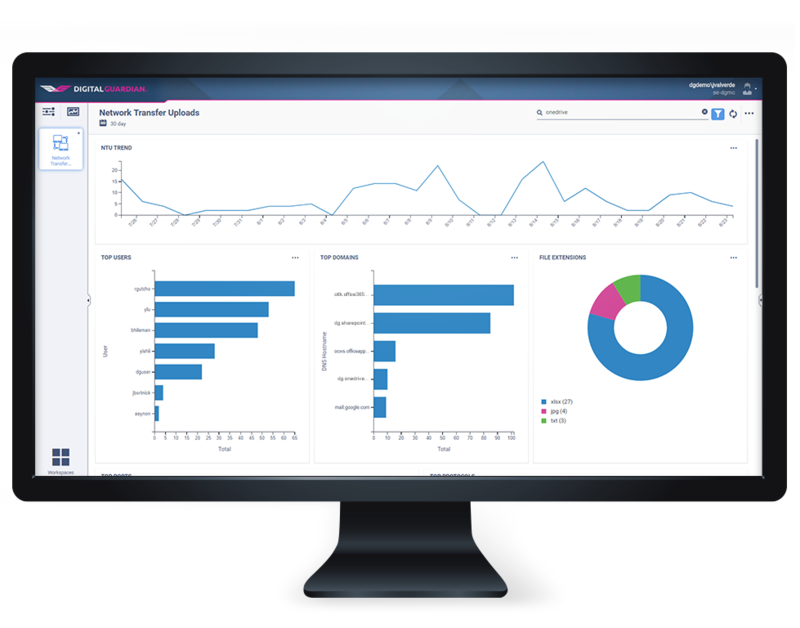 Our enterprise-wide visibility shows your data profile from the endpoint to the cloud and our real-time analytics provide the insights to secure your business and document compliance to regulations. Finally, Digital Guardian’s flexible controls range from logging activity to automatically blocking uploads of sensitive data. Microsoft built in a baseline of security, but organizations need more than just a baseline. Digital Guardian adds comprehensive data loss prevention with granular classification, protection for non-Microsoft documents, and enterprise class analytics and reporting. While the cloud is becoming a de facto part of the business, there are still pools of data on premise. Digital Guardian protects your sensitive data regardless of where it lives during the transition. With the multiple products within Office 365 such as email, cloud storage and both online and native Office documents, being able to create a single data protection policy that covers them all reduces InfoSec overhead and ensures consistent application of a policy. A user at a regional credit union created an Excel Online spreadsheet while using her personal laptop. Digital Guardian analyzed the document but didn’t find any sensitive data. The next day the user accessed the same document from her work laptop and attempted to add customer credit card numbers to the Excel Online spreadsheet. Digital Guardian recognized this, prompted the user about the risky actions and prevented the information from being stored in the document. An alert to the InfoSec team notified them of this potential data loss incident for follow-up.